The remedy for retrieving our stolen liberties from fascism of the left is not communism of the left, but Americanism of limited government under a constitutional republic. 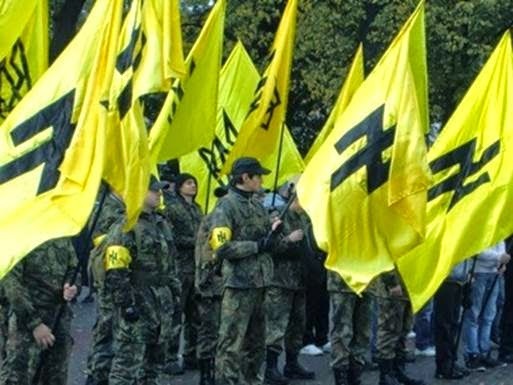 From Hitler's Germany in the 1930′s to Kiev Today, the United States' Disturbing Partnerships with Nazis. (NEO) Among Washington's most unsavory allies could be counted the unelected hereditary regime of Saudi Arabia, the homophobic, violent mobs of Thaksin Shinawatra in Thailand, and of course Al Qaeda who has been serving America's geopolitical agenda since the 1980′s when it first gathered the sectarian extremists together as a mercenary army to fight the Soviet Union in Afghanistan. Today the global terror enterprise is fighting on NATO's behalf in Libya, Syria, Egypt, and southern Russia. But there is one group in particular that special interests within the United States has coddled, before, during, and after World War II that is perhaps the most iconic villain of recent human history Adolf Hitler's Nazis. 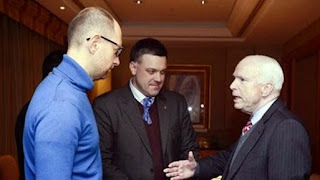 A long and checkered history entwines the United States with the Nazi regime, leading up to present day where the heirs of this toxic ideology are being provided political and material support in overrunning the Eastern European nation of Ukraine. George Bush's grandfather, the late US senator Prescott Bush, was a director and shareholder of companies that profited from their involvement with the financial backers of Nazi Germany. The Guardian has obtained confirmation from newly discovered files in the US National Archives that a firm of which Prescott Bush was a director was involved with the financial architects of Nazism. 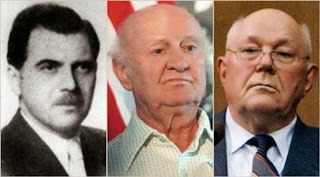 His business dealings, which continued until his company's assets were seized in 1942 under the Trading with the Enemy Act, has led more than 60 years later to a civil action for damages being brought in Germany against the Bush family by two former slave labourers at Auschwitz and to a hum of pre-election controversy. Chase National Bank the precursor of today's Chase Manhattan Bank allegedly helped the Nazis plunder Jewish property in France during World War II, according to a published report. The New York-based bank controlled by the Rockefeller family closed Jewish accounts even before the Germans ordered them to do so and did business with the Nazis while they were sending Jews to the gas chambers, Newsweek magazine reports in this week's edition. And while the U.S. was at war with the Nazis, Chase also apparently helped German banks do business with their overseas branches, the magazine reported. Chase Manhattan is now the largest bank company in the U.S. with more than $300 billion in assets. Recently declassified documents revealed that at least 300 U.S. companies continued doing business in Germany during the war, Newsweek reported. And subsidiaries of Ford and General Motors have been accused of forcing thousands of Jews, Poles and others to work as slave laborers. Clearly before and during World War 2, a substantial representation of special interests within the United States chose opportunism over American values aiding and abetting one of the worst purveyors of human misery in the 20th century. While some may claim that this was merely a handful of special interests within the US and did not represent the overall political agenda of America, it should be noted that many of these special interests were holding or influencing offices of power while collaborating with the Nazis, and continued to do so well after the war was over. 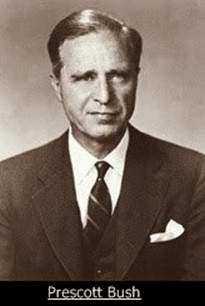 Prescott Bush, for example, was a US Senator until 1963 and the Rockefeller family would fill positions as governors, senators, and even the US vice presidency. After World War 2, the United States rushed to gather up Nazi intelligentsia to exploit their talent in America's own bid for global hegemony. Perhaps the report's most damning disclosures come in assessing the Central Intelligence Agency's involvement with Nazi émigrés. Scholars and previous government reports had acknowledged the C.I.A. 's use of Nazis for postwar intelligence purposes. But this report goes further in documenting the level of American complicity and deception in such operations. The Justice Department report, describing what it calls "the government's collaboration with persecutors," says that O.S.I investigators learned that some of the Nazis "were indeed knowingly granted entry" to the United States, even though government officials were aware of their pasts. "America, which prided itself on being a safe haven for the persecuted, became ― in some small measure ― a safe haven for persecutors as well," it said. While collaboration with the Nazis before and during World War 2 was mainly the domain of monied special interests with political influence over the US government, Operation Paperclip and the harboring of Nazis with dark pasts was the occupation of the inner most workings of the US government itself. Little is revealed in the way of what "intelligence purposes" these Nazis were used for, but right-wing fascist juntas across the world during the Cold War, particularly in South America where the Nazis had a foothold during the World War, might offer some hints. …while the gains of the orange-bedecked "chestnut revolution" are Ukraine's, the campaign is an American creation, a sophisticated and brilliantly conceived exercise in western branding and mass marketing that, in four countries in four years, has been used to try to salvage rigged elections and topple unsavoury regimes. Funded and organised by the US government, deploying US consultancies, pollsters, diplomats, the two big American parties and US non-government organisations, the campaign was first used in Europe in Belgrade in 2000 to beat Slobodan Milosevic at the ballot box. While the Guardian attempts to justify American meddling in multiple nations as an attempt to "salvage rigged elections and topple unsavoury regimes," it does not deny that the meddling took place and goes on to explain in great detail just how that meddling was carried out. The ultra-right Neo-Nazis now occupying Kiev in the wake of the so-called "Euromaidan," are the heirs of the "Orange Revolution." The parties that benefited from 2004′s unrest, including the "Fatherland Party," now hold power. While the "Orange Revolution" was carried out more covertly, the "Euromaidan" was openly backed by both the US and the European Union. At the height of the protests, US Senator John McCain would literally take the stage with the ultra-right, Neo-Nazi Svoboda Party leaders as well as meet with "Fatherland Party" member and future "prime minister," Arseniy Yatsenyuk.